The need to provide solutions for high-performance applications in advanced gas turbines initially drove the development of ceramic rolling elements for use in bearings. This was followed by the use of ceramic rolling elements in other applications, such as machine tool spindles, electric motors and generators. More than 400 years ago, the first industrially produced ceramic balls were marble balls used as cannonballs, jetsam and children’s toys. The advent of new engineering ceramics in the 1960s and 1970s transformed these humble marble balls into high-performance ceramic bearing balls, which are being tested in jet engines and commercialized for machine tool spindles, electric motors, Formula 1 race cars and pumps. Recent new hybrid bearing business can be found in railway applications and renewable energy applications such as windmill generators. 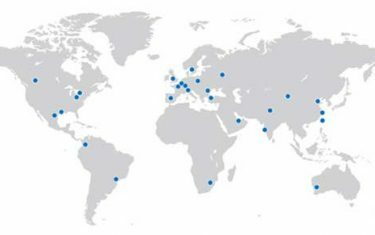 SKF remains in the forefront of ceramic bearing ball development, industrialization, application and standardization. Development work is still going on, especially in the larger ball size range. 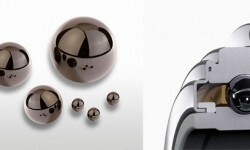 Silicon nitride bearing balls up to 1.875 inches in diameter are already commercially available. 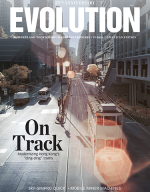 On the ceramic material side, there are opportunities to better tailor new materials to specific applications. 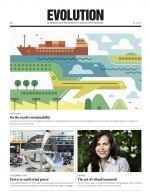 This will save cost and also help the environment, as less energy-consuming processes are established for new production units to fulfill the growing demands for these new materials. Hybrid rolling bearings incorporating ceramic rolling elements are used for many challenging applications. Some recent applications include the railway industry and renewable energy business such as windmill generators. Bearing grade silicon nitride, Si3N4, is the current standard material for rolling bearings and meets international standards, and testing and inspection methods (fig.1) have been established, all of which accommodate the trend toward larger-size ceramic balls. High-quality silicon nitride bearing balls up to a diameter of 1.875 inches (1 7/8”) are now commercially available. Ceramic, stone and marble balls have a long history of use as cannonballs and jetsam and, of course, in children’s games. The development of synthetic engineering ceramics in the 1960s and 1970s led to high-performance silicon nitride ceramic bearing balls becoming the state of the art for use in such diverse applications as jet engines, machine tool spindles, electric motors, Formula 1 race cars, pumps, etc. Further development work is still under way, especially in the larger ball size range. An important driving force behind the development of modern engineering ceramics has been the dream of developing a very efficient gas turbine engine. 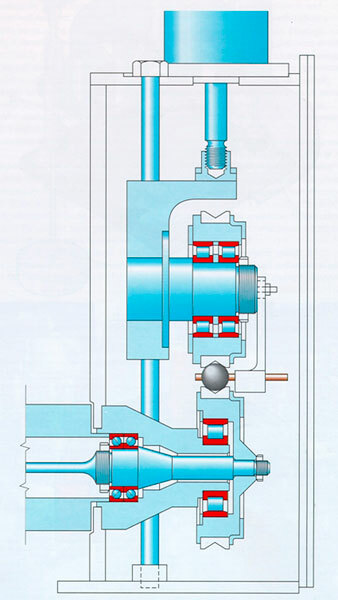 The operating conditions for the main shaft bearings of such engines are extremely demanding, with shaft speeds in excess of 30,000 rpm and predicted bearing temperatures higher than 1,200°F . At gas temperatures above 2,000 °F, only high-performance ceramic materials with a higher hardness than bearing steels or even high cobalt-based stellites and high tungsten alloy tool steels are considered. The primary use of gas turbines has been in jet engines. This application demands materials that are low in weight (low density) and high in strength and can withstand high temperatures, as well as meet many additional requirements such as stiffness, processability and availability. Ceramic materials were known to fulfill the first two requirements, high temperature and low density, but they were also known to be weak and brittle. Research efforts in the space and defense sectors were applied to understand why ceramics were weak and how this property could be improved. 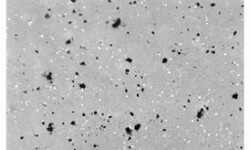 The resultant theories, methods and processes yielded improved ceramics and new synthetic ceramics, such as silicon nitride. 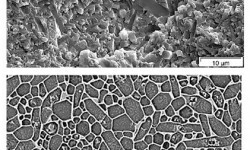 The SKF Engineering and Research Center (ERC) in the Netherlands has worked extensively with ceramic materials from a very early stage of their development. (fig. 2). During processing, the balance between the two phases can be adjusted to obtain a tough material. The first silicon nitride that became commercially available with a strength and toughness suitable for bearing applications was hot pressed or hot isostatic pressed (HIP) silicon nitride. During the 1960s and 1970s the SKF Company Marlin Rockwell Corp. (MRC) in the United States designed the first ceramic bearings. 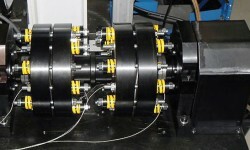 The hybrid bearing , which had a split inner ring, was manufactured by MRC for a test program financed by the U.S. government. The long-term operation of the silicon nitride material in a bearing using solid lubricants at temperatures above 930 °F was demonstrated during 1984  by SKF. 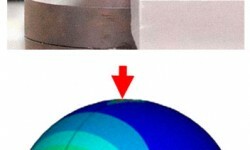 Around 1990, beside aerospace test programs, the machine tool industry started to exploit the advantages of the lightweight, high-speed features of ceramic balls. In the mid-1990s, frequency converters for electric motors started to use fast-switching electronics, which caused electric current damage in standard bearings. Hybrid bearings offer a very robust alternative for electrical insulation solutions. At about the same time, several hybrid-bearing solutions were introduced for Formula 1 race cars, making use of their robustness under very demanding conditions (marginal lubrication, heavy loads and high speeds). 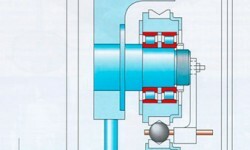 The use of hybrid bearings in pumps and compressors arrived in about 2000, allowing marginal lubrication conditions and applications where fluids with lower viscosity than lubrication oil, such as refrigerants, were acceptable as lubricants. Also, the excellent corrosion resistance of ceramics drove their use in sour gas compressor applications. More recently, in the renewable energy business, ceramics have found applications in wind turbine generators. For this purpose, large (1.875-inch diameter) ceramic balls are required (fig. 1). Another growing application is the railway industry, where ceramic rolling elements are used in traction motors (fig. 3). Electrical insulation and the better performance of ceramic rolling elements under relatively light loads (they generate less frictional heat) are increasing the grease life in this application. 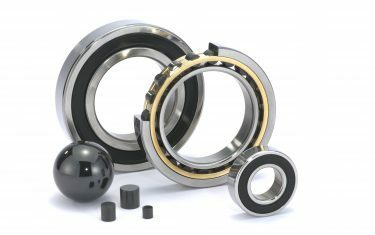 A broad range of rolling bearing applications can benefit by the introduction of ceramic balls. To make sure that ceramic materials perform optimally in an application, a careful assessment of the materials used for bearing balls is necessary. Test procedures have been established over time for this purpose. In general, a first material assessment can be done by checking the macrostructure (fig. 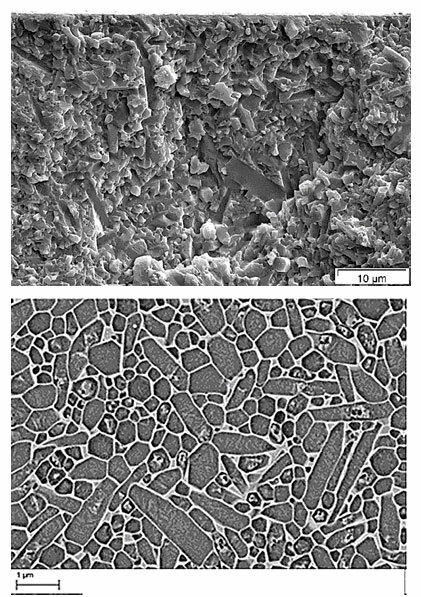 4, top), microstructure and homogeneity (fig. 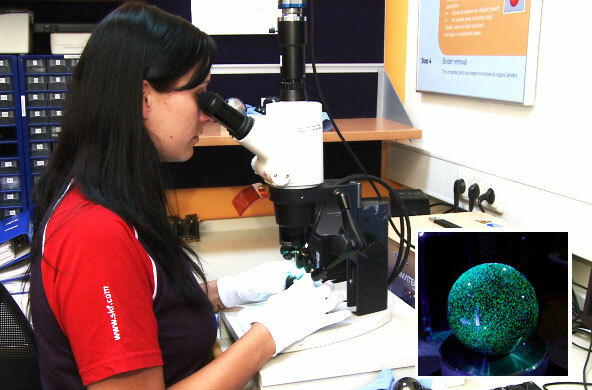 4, middle) on sectioned samples from blank or finished ball materials by sample mounting and polishing. Also hardness and indentation fracture resistance for a possible bearing material candidate can be determined relatively quickly (fig. 4, bottom). New methods for testing the strength of finished ceramic balls have been developed. Especially in high-strength materials, it has been seen that the surface quality has a significant influence on strength. And the surface quality of a bearing ball is much better than that of a reference sample bending bar. The “notched ball” test (fig. 5) has the advantage that strength can be evaluated on real bearing balls and not on bending bars as specified at present in ISO 26602:2009. The balls are notched and loaded vertically. They act in a similar way to bending bars. Details about this test are published [2, 3]. It has been shown  that surface defects such as Hertzian “C” cracks have a significant influence on ball strength. An initial idea of cyclic rolling contact fatigue can be evaluated by a Polymet disc on a rod machine (fig. 6). 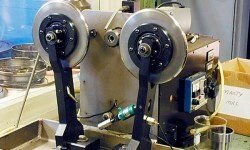 A rod is loaded between two rotating steel discs. Typically 40×106 cycles at contact pressures of 3 or 4.8 GPa are run as an acceptance test. 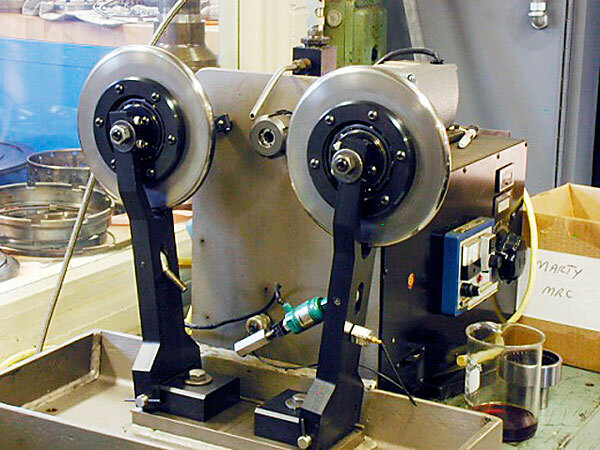 Cyclic rolling contact fatigue on finished balls can be tested with a modified four-ball test machine. 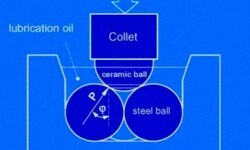 The top ceramic ball drives three bottom steel balls in a ball socket, simulating a very simple bearing (fig. 7). A similar test can also be performed as a five-ball test, using four balls at the bottom. 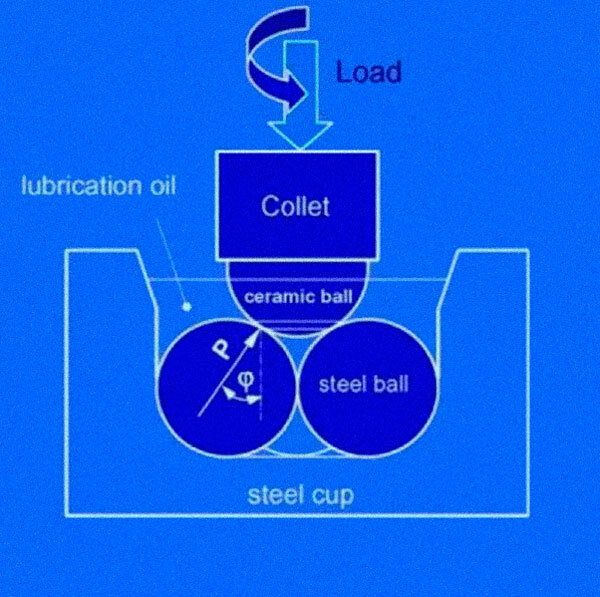 Another possibility for assessment of rolling contact fatigue on finished ceramic balls is the V-groove test (fig. 8). 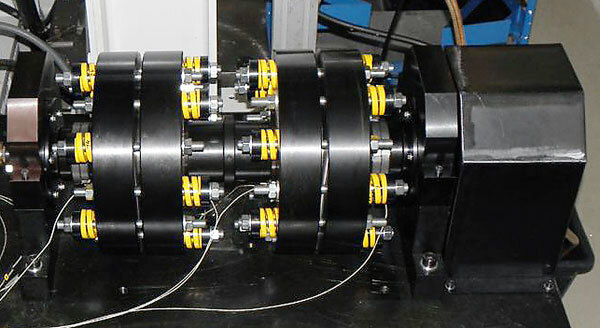 A ball is loaded between two V-grooved rings at contact pressures between 1.5 to 5.5 GPa. With the standard shaft speed, 1.125-inch-diameter balls have to withstand about 6 million stress cycles per hour. 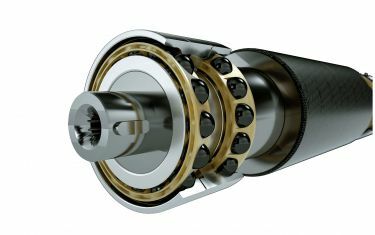 The endurance life of hybrid bearings is tested under different lubrication conditions. The typical bearing for endurance testing is a 7209 angular contact ball bearing, having 0.5-inch-diameter balls. A hybrid bearing life test with grease lubrication in larger 7318 angular contact ball bearings, having 1.25-inch-diameter balls, is shown in fig. 9. With these formal methods of qualifying ceramic rolling elements in hybrid bearings, end users can be assured of the performance of these materials in advanced applications. With continued development of ceramic materials tailored to high-performance applications, it is certain that hybrid bearings will continue to find uses in new industries with performance demands. Pallini, R.A.: “Turbine engine bearings for ultra-high temperatures,” SKF Ball Bearing Journal 234, September 1989. P. Supancic, R. Danzer, S. Witschnig, E. Polaczek, R. Morrell, “A new test to determine the tensile strength of brittle balls — The notched ball test,” Journal of the European Ceramic Society 29 2447–2459 (2009). P. Supancic, R. Danzer, W. Harrer, Z. Wang, S. Witschnig, O. Schöppl, “Strength Tests on Silicon Nitride Balls,” Key Engineering Materials Vol. 409 pp 193-200 (2009). P. Supancic, R. Danzer, Z. Wang, S. Witschnig, O. Schöppl, “The Notched Ball Test – A New Strength Test for Ceramic Spheres,” 9th Symp. on Ceramic Materials, Shanghai (2008).